My husband is awesome. Aside from his proven ability to build things, fix things, and design things, he has a great talent of teaching me how to use things. Like my new favourite tool. On the weekend, we decided we just had to have this nifty new compressor and all its assorted gadgets. Seriously, I don’t know how we’ve lived without one for so long. 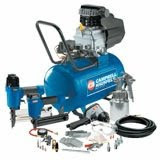 Unpainted door trims, frames, office chairs, and doors have been slowly eating up our valuable garage space, so we finally bit the bullet and bought this compressor which came with spray gun, impact wrench, stapler, tire inflator and many other goodies. Annnnd apparently he's awesome at convincing you to buy things lol. Just kidding, that is awesome you put it to work and got your money's worth so quickly! Hmmm, come to think of it, it was his suggestion ;) I think it was the prospect of painting the 32 pieces of door and window trim by hand this weekend that made the decision easy, lol. I had to laugh at this post--I learned how to use one of these things over the past weekend. According to witnesses, I was a real sissy who jumped every time the thing popped. But aren't they nice toys? The next time you go tool shopping stop by www.nonprofitshoppingmall.com first and look for tools at The Home Depot or ACE Hardware. If you buy your tools this way through the website: www.nonprofitshoppingmall.com you can choose a percent of your sale to be given to the nonprofit group of your choice.